The Nestle Isosource High-Nitrogen Complete Unflavored 8oz Can, Model #18450000, is anchored in advanced science and research. Nestle Healthcare Nutrition offers nutritional solutions for people with specific dietary needs related to illness, disease states or the special challenges of different life stages. 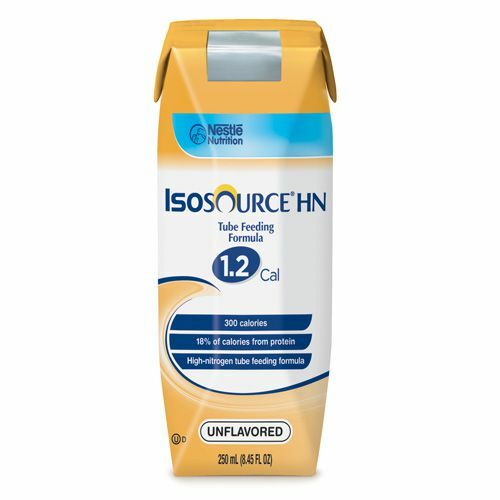 The Nestle Isosource High-Nitrogen Complete Unflavored 8oz Can is a nutritionally complete liquid formula with high-protein, standard nutritional support. 100 Percent of the RDI is in 1400 calories. Can be used for the diatary management of oncology, dysphagia, malnutrition and stroke/cerebrovascular accident. Nutritionally complete liquid formula with high-protein, standard nutritional support. 100 Percent of the RDI is in 1400 calories. Recommended alternative for Isocal HN. Ideal for malnutrition & transitional feeding.Provides concentrated nutrition with 1.2 cal/mL.